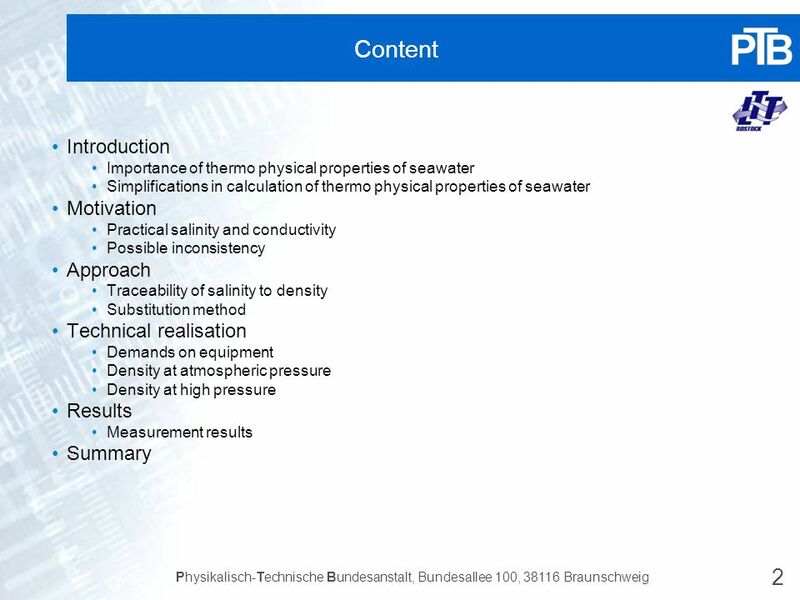 Realisation of a Substitution Method to Perform High Precision Density Measurements of Seawater Hannes Schmidt Henning Wolf Egon Hassel. /2000-years-of-global-temperatures-small.gif /climate_files/ClimateSimulation_ _IPCC2007.JPG Measurement data is used for understanding and prediction of climate on long term scales. 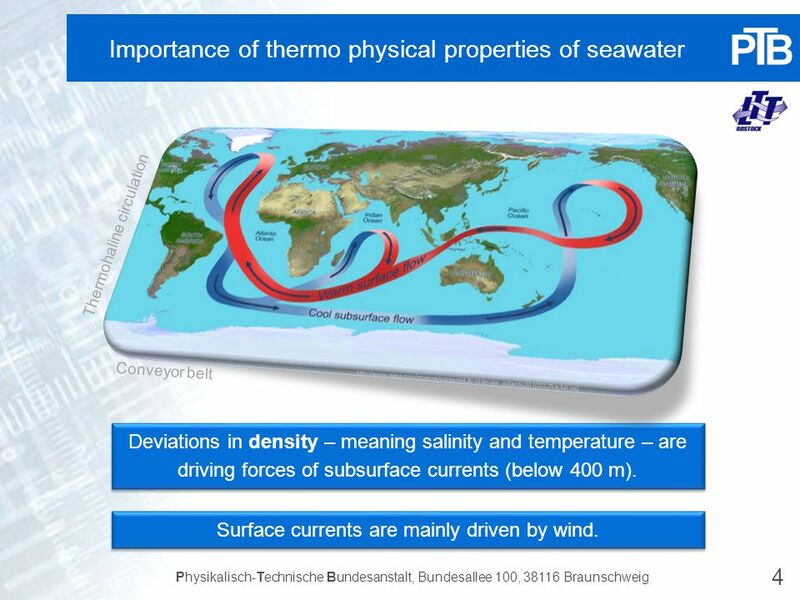 Thermohaline circulation Conveyor belt Deviations in density – meaning salinity and temperature – are driving forces of subsurface currents (below 400 m). Surface currents are mainly driven by wind. 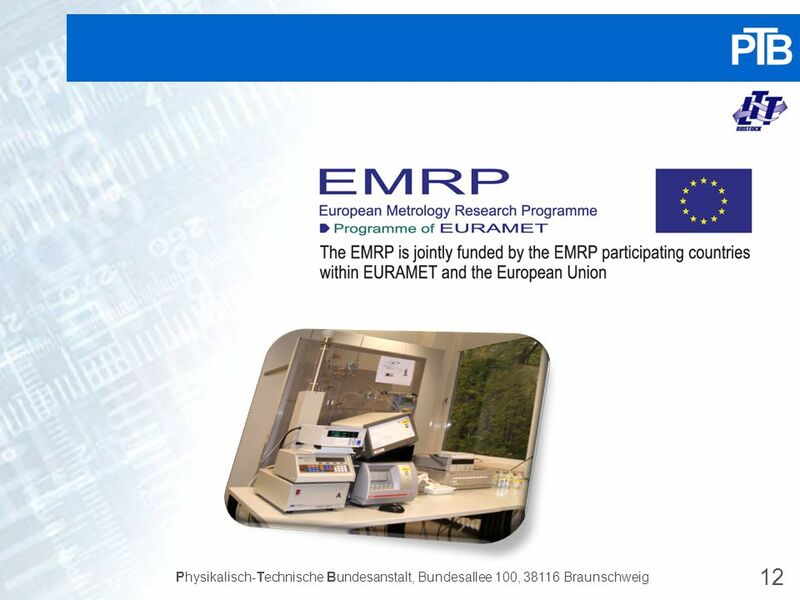 Source Theoretical Measurand Pressure, Temperature, Conductivity N-1 amounts of substances Resulting relation e.g. 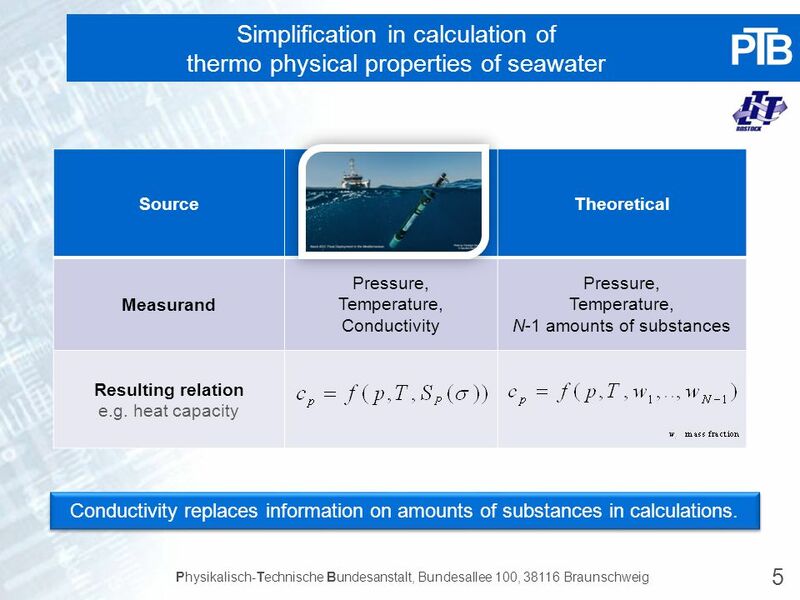 heat capacity Conductivity replaces information on amounts of substances in calculations. Sources Simplification by using conductivity Practical salinity determination salt composition is changing salt composition is changing (!) 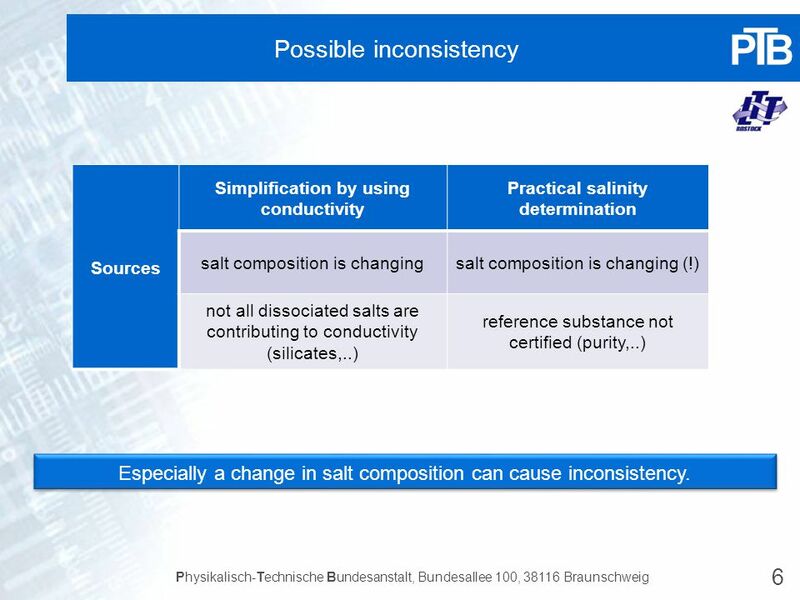 not all dissociated salts are contributing to conductivity (silicates,..) reference substance not certified (purity,..) Especially a change in salt composition can cause inconsistency. 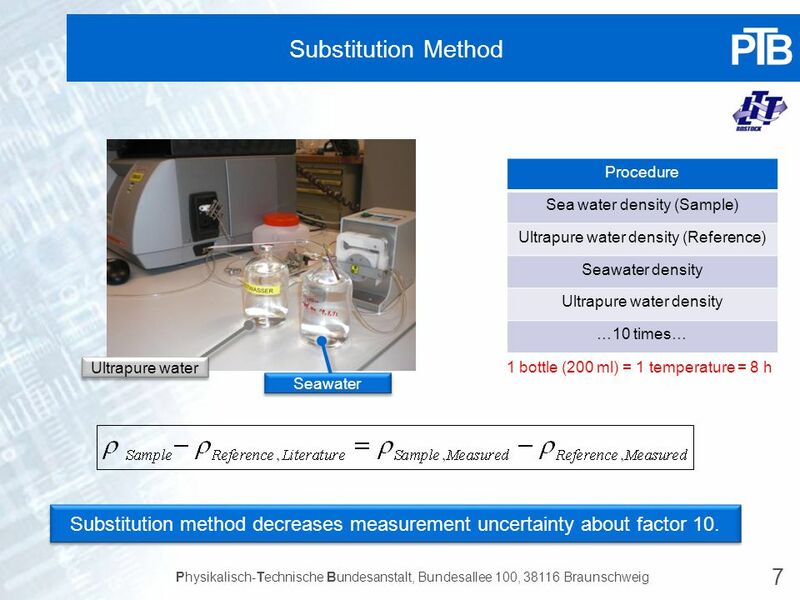 7 Substitution Method Procedure Sea water density (Sample) Ultrapure water density (Reference) Seawater density Ultrapure water density …10 times… Ultrapure water 1 bottle (200 ml) = 1 temperature = 8 h Seawater Substitution method decreases measurement uncertainty about factor 10. 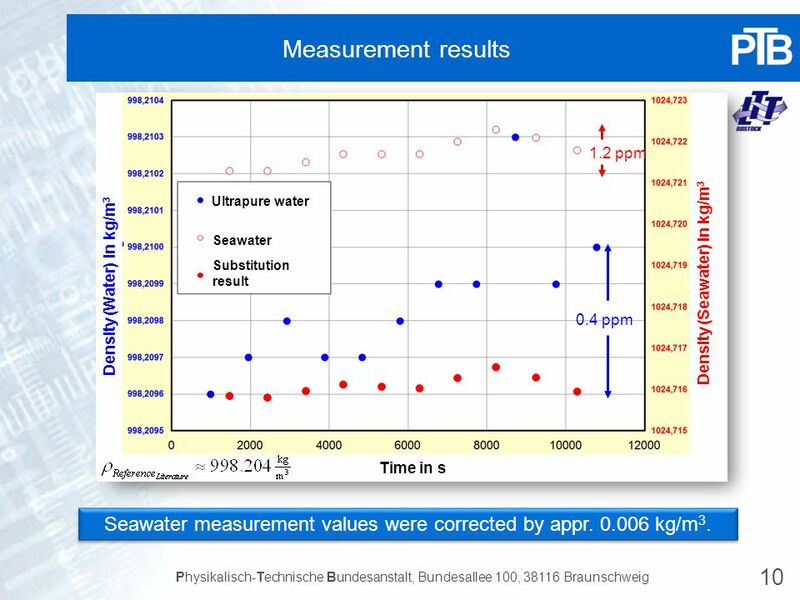 Measurement results 1.2 ppm Ultrapure water Seawater Substitution result Density (Seawater) in kg/m3 Density (Water) in kg/m3 0.4 ppm Time in s Seawater measurement values were corrected by appr kg/m3. 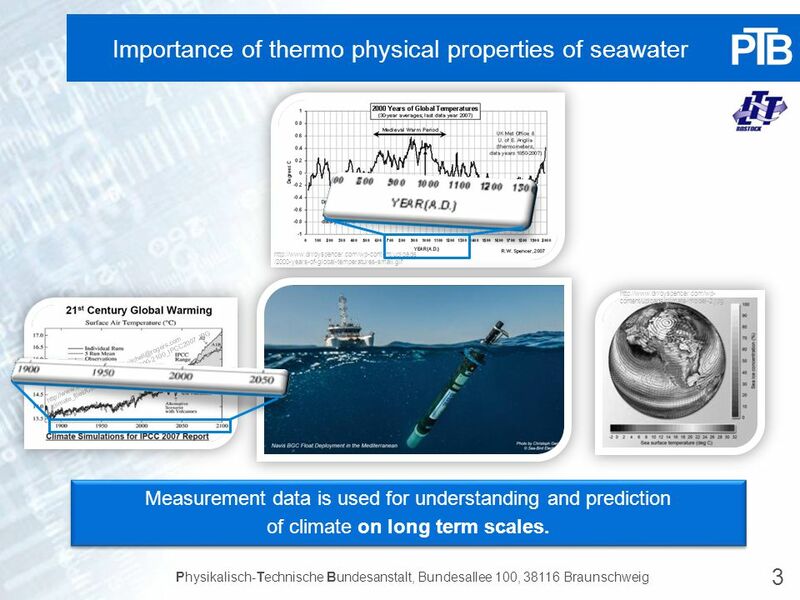 11 Summary Calibration and measurement routines for seawater have a risk of data inconsistency when data is collected over decades. 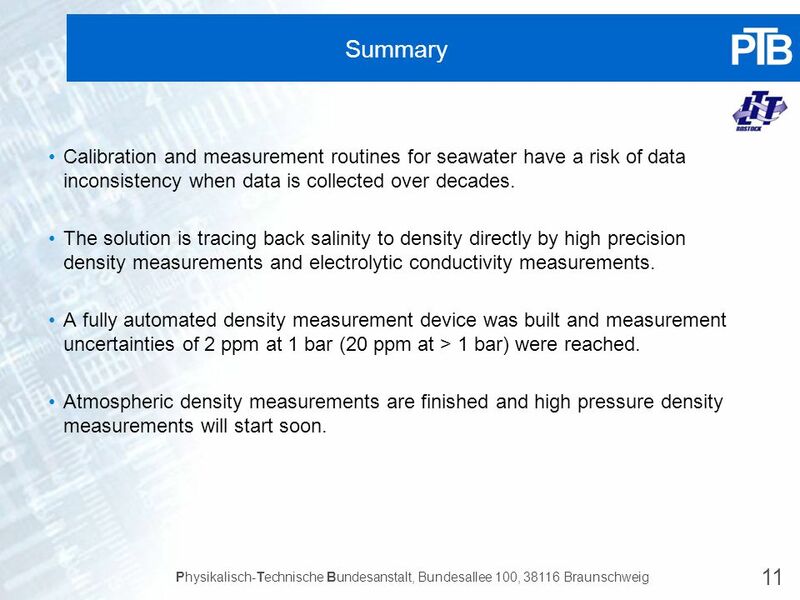 The solution is tracing back salinity to density directly by high precision density measurements and electrolytic conductivity measurements. 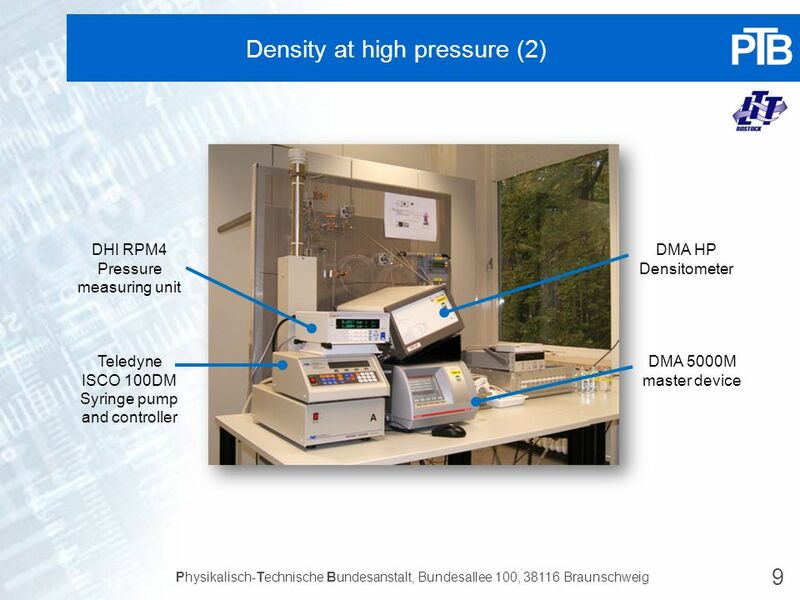 A fully automated density measurement device was built and measurement uncertainties of 2 ppm at 1 bar (20 ppm at > 1 bar) were reached. 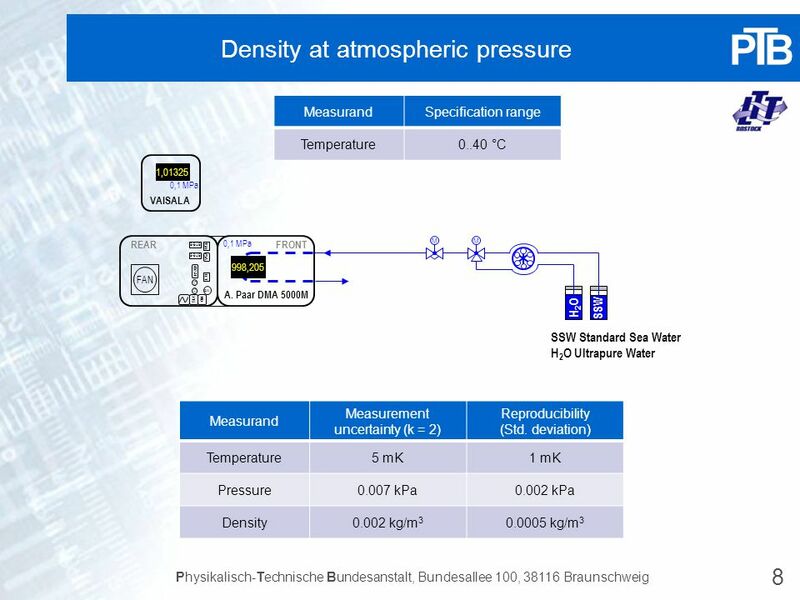 Atmospheric density measurements are finished and high pressure density measurements will start soon. 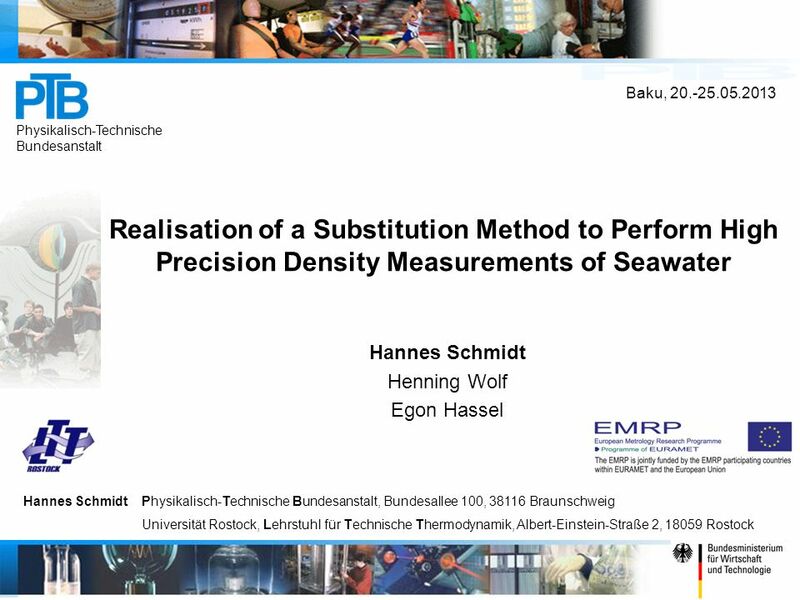 Herunterladen ppt "Realisation of a Substitution Method to Perform High Precision Density Measurements of Seawater Hannes Schmidt Henning Wolf Egon Hassel." Deutsches Zentrum für Luft- und Raumfahrt e.V. German Aerospace Center Institut für Physik der Atmosphäre Atmosphärische Aerosole The Multi-Angle Absorption.